A young woman has difficulty adjusting to life in a small town in Minnesota. Ninety years after publication, Sinclair Lewis’s Main Street still resonates with readers ... The book became an immediate sensation. Biographer Mark Schorer called its publication “the most sensational event in twentieth-century American publishing history.” ... Lewis found a way to appeal to both those who were nostalgic for small town America and those who were dissatisfied with it. 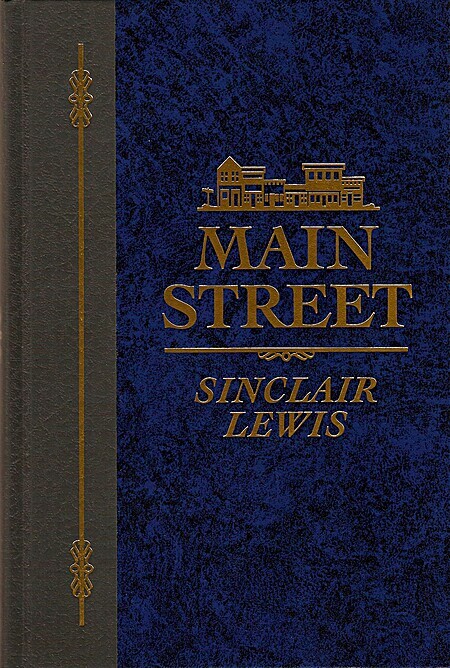 In Main Street, Sinclair Lewis provides a crystal-clear picture of small-town living during the early part of the twentieth century. The result is a charming, honest look at one small, Midwestern town and all of its inhabitants. While the language, mode of dress, and popular activities may be antiquated now, the interactions and struggles remain as true today as they did in the 1910s. More importantly, through Carol's fight to accept her lot in life, Lewis presents a study of humanity that never ages. Much of what is fascinating about Main Street is the intimate look at small-town life in the 1910s. The language is quaint and full of forgotten expressions. Societal teas, drama clubs, buggies versus cars, new suits purchased once a year - these are all things which are intriguing from a purely historical perspective. Lewis was writing based on his own personal experiences, which lends credence to his narration and brings history to life. However, a modern-day reader can easily imagine how uncomfortable a reader of Lewis' era would be at reading Main Street, as it is a no-holds-barred satire on the minutiae of daily small-town living. Speaking of which, many of the difficulties of Main Street and its impact lie in how much life and society has changed in 100 years. Carol's life as a housewife, complete with servant, would be drastically different today, as her freedom to do as she pleases, to work, to form committees, is so much greater than the time period in which the story takes place. The reader has to ignore the differences and get to the heart of Carol's struggles for happiness to be able to detect why Main Street is relevant today. Carol's happiness does not depend on her status as a wife or her inability to make changes in her adopted town, but rather stem from her inability to find inner peace. It isn't until she makes peace with her life and dreams where she finally finds the contentment she so desperately seeks. This need for inner peace is something to which any reader can relate and proves that humans everywhere have been searching for their own inner peace for ages. Carol Milford, college graduate and librarian, thinks very highly of herself and her abilities. When she receives a proposal from Dr. Will Kennicott of Gopher Prairie, Minnesota, she accepts since it will allow her to fulfill her aspiration of being a big fish in a small pond. She plans to single-handedly “improve” the small Midwestern town to fit her image of beauty and refinement. To her surprise and dismay, the town resists all of her efforts. I had little sympathy for Carol. She thinks so highly of herself, yet she behaves as a dilettante. She tries to force her will on her husband and neighbors without making an effort to get to know them as individuals. Her only admirable quality is her acceptance of other outsiders in the community. If only she could have extended the same generosity to her husband and his friends. In the end, it isn't the town that changes. It's Carol. I wouldn't call this conformity or resignation. I'd call it maturity. Well, he's got their number, all right. This is almost a book that I'd call something like a "gray masterpiece," if that weren't so manifestly grandiloquent for a story like this one (Lewis tries to cover this with all that "Sam's store is every store" crap at the beginning, but he is wrong. This book is really good, but it is small). But it approaches "masterpiece" in places, if only the whole weren't less than some of its wrenchingest parts. And it really, truly does belong to it's historic moment, doesn't it? Thirty years later Carol would have been a firebrand, and this would have been a novel of rebellion and easier to love for me here in 2008, instead of so . . . pathetic. Thirty years earlier and there'd have been no story. She'd have been bored but content. In a French town she'd have been Madame Bovary. Yeah, you should probably read this. It's f*ck*ng good. It's just hard to love. Carol is a university student in St. Paul, Minnesota in the early 1900s. She doesn't want to just settle for getting married to some boring guy who won't understand her desire to do something, to make a mark. (She reminded me a bit of George Bailey from It's a Wonderful Life here in the beginning.) She meets Dr. Will Kennicott, and they seem to have a meeting of the minds. He lives in Gopher Prairie, a small town, but surely being a doctor's wife will be fulfilling? All that prestige and excitement, and then their good conversations at home? Gopher Prairie could have been any town in the US at the time the book was written - towns with a railroad station and sturdy unimaginative buildings, filled with sturdy and unimaginative people. It could still be many towns across the country today, and a lot larger ones these days, as they have become interchangeable plots of mini-malls that blend into each other along the highway. Is this the chain coffee shop/grocery store/sandwich shop complex in my city, or yours? Some aspects of the issues that Carol faces are dated, but I thought that far too many of them were just as relevant now, unfortunately. If you live in a small enough town, people still notice where you go, who you talk to, and they gossip about it when you fail to meet some standard of town behavior - those aspects of human nature will probably never change. Carol's attempts to convince the townspeople, to rebel against them, to ignore them, to make nice, all have a sort of futility that anyone can understand who's ever been in a difficult situation where every effort to create a sustainable change in either your environment or your own attitude about it seems to fail. In many ways, I felt like what made this a difficult read was the feeling that all of this was new when Lewis was writing about it, and now we are just that much further down the path. Not only has not much changed, most of it has only intensified. Recommended for: people from small towns, square pegs. Main Street is about an educated, intelligent woman, Carol, who married the town doctor of a little village called Gopher Prairie, whose intelligence and opinions constantly breaks against the general feeling of the sleepy town like waves against resolute rocks. The town is politically conservative - to the point where the sheriff led the townspeople to beat up and drive out a suspected socialist speaker who wanted to speak to an assembly of speakers. Carol is liberal. The main entertainment to be had at dinners or social gatherings is petty gossip and that neighbours should spy upon each other for gossip fodder is the natural order. Carol likes to read books - Shaw, Romain Rolland, etc. company. Carol wants to enact many reforms on the town such as a new town hall, but they are all rejected and laughed off by the town. In contrast to Carol, Carol's husband has no appreciation for any of the things that Carol holds so dear, like art music or literary books or poetry - he has vague memories of having studied them in university but had no real appreciation for them, calling them "high-brow stuff". He had hoped that Carol would "settle down" and forget all that high-brow stuff and be a wife in the style of the stolid, gossiping way of Gopher Prairie women. Carol stews in this oppressive environment for most of the book. Main Street has some absolutely brilliant moments of satire. In fact, at it's best it offers spot on cultural criticism that resounds well into the 21st century. That said, the somewhat scandalous elements are dated and the motif, although maybe not dated at the time, has been so often repeated in film and literature that one can't help but feel like they've heard it all before. Again, I think what shines are individual moments, pieces of prose where Lewis just perfectly captures certain archetypal characters (and their utterances) and experiences. Now, if Lewis had let Carol Kenicott evolve into a slightly more unsympathetic character, if he had taken a more critical, even handed eye to his protagonist it might have been a truly great work. I couldn't help thinking that in some of the more heavy handed moments Lewis must have been trying to do just this, but if so it doesn't come across clearly. While he beats us over the head with the narrowmindedness of the provincials, Lewis, it seems to me, spares the rod in Carol's case and ultimately spoils what could be a much better critical work. I say this because certainly for all their huffing and puffing the Carol Kenicotts of the world are really no more interesting and less hackneyed than the Sam Clarks. Had he subjected Carol to a bit more roasting Lewis might've better captured the underlying spirit of malaise and hopelessness. Finally, at times the novel reminded me of a funnier but less brilliant Winnesburg, Ohio. I guess given the subject matter this shouldn't be surprising, but that aside, thematically this notion of hopeless searching that Carol Kenicott takes on seems to have strong parallels in Anderson. In fact, the careful reader will notice that Lewis actually name drops Anderson when composing in a list of fiction Carol has been reading. On 27 Oct 1946 I said: "Started Sinclair Lewis' Main Street. Interesting in a way, though not good." On Nov 3 I said: "Finished Main Street. Not much good--written like a novel of the 'teens." This being a classic, & also being a satire, I expected it to be funny. It wasn't. It was painfully slow in places, & I could have done without it deviating from the story every so often. Other than that, it wasn't a bad story. I didn't know whether to like Carol, feel sorry for her, or to be annoyed by her overall, but I was all of these in turn. The way I see it, she probably never should have married Will at all, & he was the character I felt the most sympathy for. He was an honest country doc, hard working, with simple pleasures, his car, hunting, fishing, & his family. A bit heavy-handed, true, but still a beautiful dissection of small town American faults and foibles. To appreciate it today requires only the least bit of imagination to transfer the setting from town and rural to towncenter and suburban sprawl. In the end it was delightful. In centuries to come, people will read Lewis and find out what 20th Century America was like. His writing is substantial, nourishing and Main Street is one of his best. sharp as a button and as true as ever - main street still has the power to connect. You'd think a 400+ page book about the tedium of small town life would itself be tedious, but it actually wasn't. I was engrossed! And so happy my small(ish) town is nothing like the one described in this book! "Buddenbrooks is a pretty damned good book. If he were a great writer it would be swell. When you think a book like that was published in 1902 and unknown in English until last year it makes you have even less respect, if you ever had any, for people getting stirred up over Main Street, Babbit and all the books your boy friend Menken [H.L. Mencken] has gotten excited about just because they happen to deal with the much abused Am. Scene." One of the most developed stories I've ever read about marriage...I'm glad I finally discovered it. Found this book to be heavy going at first, but it was well worth sticking with!